The president’s portrait holds a venerable position in post-independence Zimbabwe. Not unlike its colonial predecessor’s (and in keeping with entrenched social hierarchies and royal patronage that persist in Britain), it looks down upon the toiling citizenry, casts its gaze on every space imaginable, and frames the notion of identity. Farai Mudzingwa writes about the power vested within the four corners, and the struggle – in the months following the coup that saw the exit of Robert Mugabe – not only to dislodge the presidential image, but also to claim it, to frame it anew. I don’t remember what my father looks like. In person, I mean. I know what he looks like from scanned photographs whose original prints are now lost, and from faded prints in stored cardboard boxes. He died in 1990 and most of the photographs of him are discoloured prints from official events and a handful when he was out with his mates. Mostly black and white from the early and mid-1980s, a few are colour, and taken towards his untimely death in 1990 when colour film was more widespread with personal cameras. When he died, I had just turned 11 years old. The only image in my memory which I am sure is an actual live memory, and not an image derived from photographs of him, is of him standing in the lounge, by a long cabinet on which he read his mail. He would stand there when he was on his way into the house, checking his mail, brown envelopes mostly, cigarette in hand, a tall man, a clump of tidy hair, brown face, with an outline of stubble around his mouth and chin, large spectacles. Or he would be on his way out, and then he would say something, ask about my schoolwork I imagine, a comment about my brother, or sister, or say something to mother as she went about the house. I remember his face in that moment. In that spot he stood, behind him, was a wooden picture frame. In it was a collage of family photographs. One before I was born, with my siblings and a male cousin, two years older than me, who I imagine stood in my place. There was also one of me in my nursery school graduation gown, posing on stage with my certificate. That was 1983 and the only colour photograph in that frame. Etched in my memory is one of the faded ones that has been scanned – a photograph of my father at the Lancaster House Conference in 1979. The photo was taken at the exact moment he was shaking Queen Elizabeth II’s gloved hand. As the Queen of England, in that framed image she was shaking away part of the fading British Empire, and Rhodesia, which would soon become Zimbabwe – the new country would inherit one of her many legacies: the omnipresent portrait of the head of state. Throughout the Commonwealth countries, her regal portraits were hung on walls to remind the empire of her presence. In all the self-governing outposts of the empire, her portrait stood as the supreme leader, the source of power. In my lingering mental image of my father, he stands in the lounge with the framed photograph of the Queen of England on his right, and to his left, on the next wall, hang two portraits, one of the state president, Canaan Banana, and that of the prime minister, Robert Gabriel Mugabe. Mugabe, the revolutionary icon. In his first portrait as prime minister of the Republic of Zimbabwe, his bust fills the framed photograph. He is in a pale blue safari suit, revolutionary fashion of the late-seventies and early 1980s. It is a formal suit distinctive in its colonial origins, adopted by the leaders of the frontline states, and with a nod to the Chinese and North Korean Communist style of dress. It signals the Marxist-Socialist model of governance, which Mugabe and ZANU–PF preached with momentum from the liberation struggle. Samuel Nujoma, Kenneth Kaunda and Julius Nyerere frequently wore this alternate to the conventional suit. In his long-sleeved pale blue suit, Robert Mugabe crystallised that mythical firebrand who had spoken militantly in Geneva in 1976, been the face of the Patriotic Front at Lancaster House in 1979, and had roused a nation, behind him and ZANU–PF, at an election rally at Zimbabwe Grounds in January of 1980, to sweep the first black majority government to power. This was the image that cut short Ian Douglas Smith’s 1,000-year fantasy of white rule in Rhodesia. This same image found itself on ZANU–PF campaign posters, on the 8pm news and in the daily state newspaper, The Herald. This image, in the newly-liberated peoples’ imagination, of the eloquent, intelligent and militant orator who had stood up to the colonial regime on their behalf, this image was present in that stately portrait hanging in my father’s house. Through those heady years following independence in 1980, and Mugabe and ZANU–PF’s landslide victory, the man personified the myth and the myth became the man. We sang songs about him – including Zimbabwean classics by Elijah Madzikatire and Thomas Mapfumo. He was the man who liberated us and his party printed his image on T-shirts and kangas. We made his birthday a national event. School children performed praise poetry for the icon. We named streets after him in the large towns, the only living Zimbabwean with the honour. At the National Heroes’ Acre, the grand monument to the liberation struggle for this land and posthumous honour to all who fought in it, a large wall mural, built by a North Korean company, stands on the right-hand side, depicting a bold Mugabe dwarfing and leading fighters, workers, and peasants into battle. Unlike many of my peers, I had the official portrait of this demigod in the lounge of my parents’ house, bearing down on me daily and demanding reverence from visitors entering the house. My father left active politics in 1989, one year before his death, and without his political presence, the portrait came down. Banana’s portrait had come down in 1987 after Mugabe became the executive president. The president’s portrait came off the walls in my house and moved onto the shelves in the tiny library. Yet it followed me everywhere. It hung in shops, at the police station, in my school’s office, at the traffic department, at the local hotel, at the municipal offices, in the post office and in the banks. The icon gazed. In the early evening of 21 November 2017, the portraits started coming down from their perches. They were yanked down aggressively with derisive chants, directed anger and no ceremony. The face in the portrait resigned in a terse letter read out by the speaker of parliament, Jacob Mudenda, before the full House of Assembly, who had gathered to begin impeachment proceedings against then-President Robert Mugabe. The nonagenarian was holed up in his presidential mansion under military restriction and the euphoria was swiftly directed at the symbol of his power – the concentration of his personality cult – the portrait. The gaze of the portrait, which a whole nation had grown accustomed to, an entire generation had been born, grown and emigrated under, at once became unbearable. A video, uploaded online, captured the sentiment as the stern face was lowered. 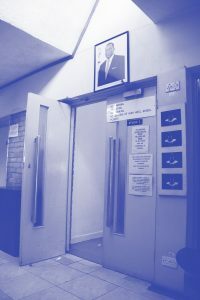 In a bizarre display, four women who during the impeachment proceedings had been in the Miekles Hotel, a five-star private establishment in Harare, barged behind the reception desk and yanked the president’s portrait off the wall. The women are civil society activists and one of them has expressed intention to compete in the upcoming parliamentary elections. They seized the moment of resignation to express their excitement in full disregard of the privately-owned establishment they were in and the private property therein. The hotel guards can be seen caught between their custodial duty, reluctance to physically handle the women, and the frenzy of the moment. In the video, the women win the battle against the guards and, outside, the large picture frame is smashed to the ground. Amid the cheers, a voice shouts at the portrait: “Akati shungurudza!” (He tormented us). The torment is economic, physical, psychological and social – violence perpetrated over the 37 years of Mugabe’s rule; violence, mostly quiet and insidious, but with sporadic, rapid outbursts, which has been acted upon individual bodies and entire communities. The first portrait of the prime minister, in its pretentious Marxist-Socialist livery, watched as its corporeal likeness organised a crack military unit to wipe out remnants of the Zimbabwe People’s Liberation Army in Matabeleland and the Midlands provinces – a consolidation of power under Mugabe. In the process, the North Korean-trained Fifth Brigade, with a chain of command outside the national army and reporting directly to Mugabe, killed thousands of civilians. over the disastrous effects of ill-advised neoliberal programs, which opened up the fragile economy to global economic forces. The Economic Structural Adjustment Program accelerated the decline of the Zimbabwean currency, social institutions and national livelihood. The Willowvale Motor scandal of 1988 normalised the lack of ramifications for government officials involved in state corruption. The third portrait, prevailing at Mugabe’s resignation, and most recognisable, was taken in 1995 by a new presidential photographer. This portrait has looked on in smugness as unchecked state power has morphed into a lunatic and repressive regime. A broken country in which the young aspire to leave and the old depend on the young who have left. As in the family portrait that hung in my parents’ lounge, many families have faces missing in theirs – some died trivialised deaths due to broken infrastructure, a handful are eking out a living here, and many are dispersed across the globe. But the portrait of the president has a life of its own. It is an entity, a being, a centre of reverence. In a video of an Independence Day event on 18 April 2016, Mugabe, in his ceremonial drive around the arena, stops his vehicle beside his mounted portrait and bows before it before proceeding. On a 2017 trip through Zimbabwe, an American tourist, Richard Elfers, decided to photograph a portrait of Mugabe hanging on a wall at the Beitbridge border post. Immigration officials detained and questioned him, and made him delete the images. Photographers around Zimbabwe have similar encounters with the public and state security agents even when there are no genuine state security concerns. The culture of paranoia and suspicion, which peaked during the 2000s when Mugabe heightened antagonism between Zimbabwe and Western countries, has not subsided. During the military coup of November 2017, a liberation war veterans’ leader called for a citizens protest march to pressure Mugabe into resigning. The marchers’ path went past the ZANU–PF headquarters, on the grounds of which stood a massive billboard banner with the image of Mugabe, 30 years younger, in his long-forgotten safari suit. The banner indicated another of his Youth Interface rallies, which his wife Grace had used as a purging platform for intra-party opponents who stood in her path to the state presidency. Even in that protesting crowd, youths who threw rocks and perforated the banner, did so under remonstration from other marchers. Thirty-seven years under those thick-rimmed glasses had moulded fear into respect and conditioned decorum in the presence of Mugabe’s likeness. As the mood heightened and the youths grew bolder, a couple of boys scaled up onto the structure and ripped out Mugabe’s face, in a premonition of the scenes that would play out across the country three days later, when he would eventually resign. e’s portrait, and brandished this new personality for all to see. Loud cheers of approval rang out. The nation could only stare into the dizzying abyss of freedom for six seconds, before it clamoured back to what is familiar. The collection of presidential busts and portraits in the United States is a function of the office, not of the individual. The faces are nothing more than a record in the institution. The office is always bigger than the incumbent and these likenesses are usually commissioned a few years after the person has left office. The portraits are also housed in the National Portrait Gallery and the incumbent’s face is not ubiquitous in public or private premises. North Korea also memorialises the images of past leaders in portraits, although there it’s taken to the extreme, and for different reasons. Portraits of Kim Il-sung and Kim Jong-il, grandfather and father, respectively, of Kim Jong-un, hang prominently in many homes, schools, on public and private walls, and grace giant murals and statues in public squares. The practice raises the profile of the office of the leader, the revolution through which he came to power, and most pointedly, the supremacy of the Kim dynasty. Kim Il-sung was the founding leader of the Republic of North Korea and ruled from 1948-1994. His son, Kim Jong-il, took over until his death in 2011. Kim Jong-un has been in power since then. Each succeeding son cements the family rule by fortifying the personality of his father in portraits around the country. There are millions of portraits of Kim Il-sung in public and private spaces around North Korea and, since Kim Jong-il’s death, the portraits are mounted as a pair. The cult of personality uses idealised images of the deceased leaders to manufacture sentiment and, by inference, inspire reverence for the current leader, whose portraits are not displayed as much. In Zimbabwe under Robert Mugabe, the office of the prime minister and the person of the prime minister swiftly merged into one. The newly independent government reached out to North Korea and their architectural involvement is evident in the structure of Heroes’ Acre. The mass parades and colourful celebrations on state occasions also mimic North Korean state celebrations. 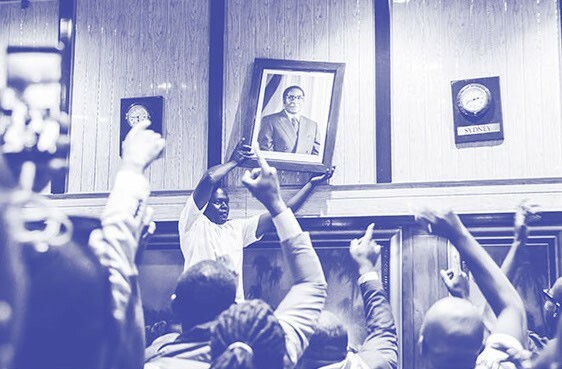 The ZANU–PF party model of reverence and patronage towards Robert Mugabe was extended to the state and reflected in the displays of his portrait. The portrait was a reminder of who was in charge and also who was responsible for the failed state and mockery which Zimbabwe had become under Mugabe. It was not a veneration of a past leader, but deification of the current ruler. 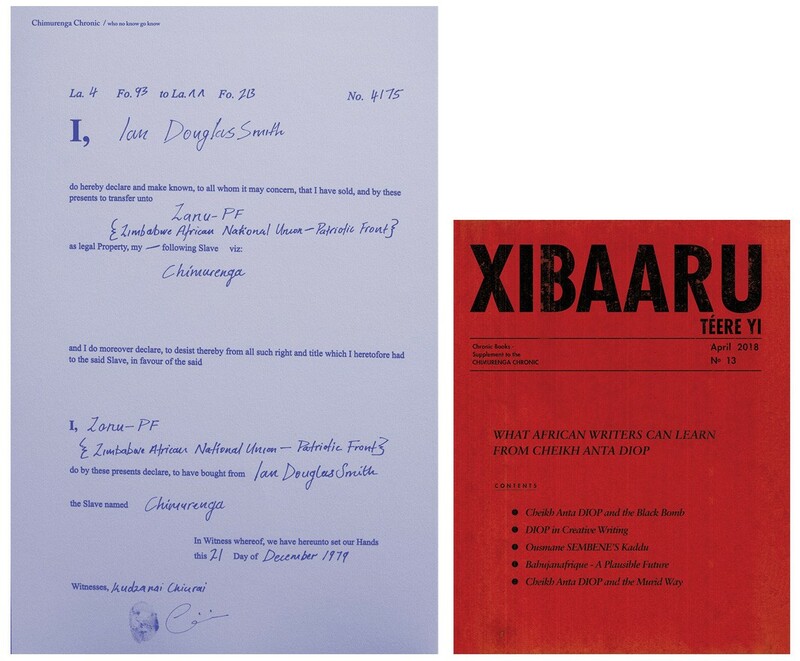 The portrait took on a life of its own, a reminder of how things work, and the source and centre of power in Zimbabwe. The portrait declared there were no leaders before, there is a leader now, and no worthy successors. Zimbabweans would only be free from the gaze of the portrait, and all the hardship associated with it – it would only come down and let them breathe – when Mugabe, and the personality cult he had created, was no more. A surreal lull descended after Mugabe resigned in November 2017. True, there was celebration; the euphoria and cathartic mood prevailed well into December and trickled into the new year. Politically though, the air was dense and still, and the breathing constricted. The mostly invisible yet omnipresent eye of the partisan Central Intelligence Organisation was conspicuous in its absence. The extortionist traffic police was noticeably off the roads. The riot and general police, a blunt instrument of civil repression under Mugabe, were restricted to their stations. The dictator was gone. We were freed from the gaze of his portrait. And yet the military personnel, tanks, and trucks were still on the street. A drunk driver rear-ended me late on a Saturday night in December, a month after the coup. We were near Southerton police station, in an industrial section of Harare. After congenial discussions, my new friend and I presented ourselves at the charge office for formalities. It was almost midnight and the grumpy night-shift officers fumbled around for stationery and excuses not to work. I remember noticing the detail: the dirty counter, the worn furniture, the sleepy eyes, the police charter, the organisational chart, the photographs of the top brass, and above them, a large portrait of the new president, Emmerson Mnangagwa. The Government and ZANU–PF maintain that businesses are not compelled to display the portraits per the Constitution of Zimbabwe. The official line is that those who do so may do it to show respect to the president. This is the reason reportedly given by ZANU–PF youths as they coerced small business owners in Harare’s downtown Market Square to buy portraits of Mugabe for between US$25 and US$60. This was in June 2011, as ZANU–PF had begun their political campaigns for the 2013 national elections. In February 2018, two months into Mnangagwa’s presidency, I took a walk around this same downtown district. There were no portraits on display in the shops. As I moved further into the central business district, the shops became larger and the businesses more formal. Choppies, a large supermarket chain in which Phelekezela Mphoko, a former co-vice president and acolyte of Mugabe, reportedly has a business interest, has the portrait of Mphoko’s former workmate, now President Mnangagwa, on prominent display at the entrance of the shop. 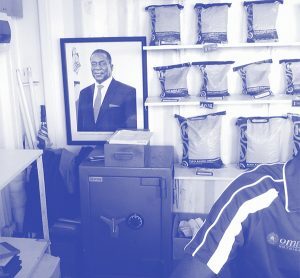 Around the corner, along Julius Nyerere Way, I walked into a small electronics shop with the portrait of Mnangagwa beaming above an array of large flat-screen televisions. After cautious preliminaries, I remarked on the portrait to the sales person, at which she grew uncomfortable and sheepishly mumbled that they were just sticking to the rules. 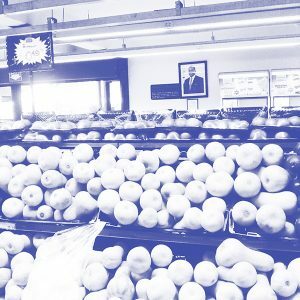 The Pick n Pay supermarket chain has branches across Harare. Their Arundel Village branch has a large portrait of the new president hanging over the cigarette counter. Their Borrowdale branch has the portrait hanging even more conspicuously on a bare wall at their customer service counter. I asked the staff member sitting behind the counter why they had the picture hanging up. 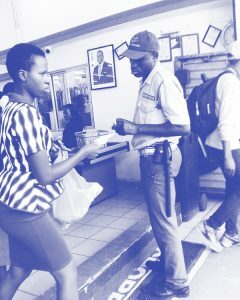 Her response: “Handiti ndizvo zvamakada imi ma customer acho” (That’s what you customers insisted on). She then went on to detail how, soon after Mnangagwa’s inauguration, they had been admonished daily by customers threatening to shop elsewhere if they did not remove Mugabe’s portrait and replace it with Mnangagwa’s. She said she understood it was a legal requirement for all businesses to display the portrait. When I asked her for the actual law, she said she wasn’t sure. She received the new portrait from the Pick n Pay head office in South Africa with instructions to display it. The men who harassed traders in downtown Harare and extorted money from them were never officially identified. They were only referred to in the media as “suspected ZANU–PF youths”. And so in February this year, a hotel manager in the Eastern Highlands tweeted “I have to find a picture of the President in Mutare tomorrow.” People had been to the hotel and asked the staff why there was no portrait on their walls. The last 37 years of ZANU–PF rule have made it clear to any receiver of that question what their next course of action should be. At the National Ballet dance studios, where the affluent of Harare take their children for lessons, the caretaker told me that he also had unidentified visitors. He said he was advised to buy the portrait which is now mounted above the entrance to the larger of the two studios. The sales person at the government printers in town regards me suspiciously when I tell her I want to buy a portrait. She asks why I, an individual, and not a company representative, wants the portrait. I tell her that this might soon become memorabilia. She doesn’t laugh with me. She instead sells me the picture for US$2. Robert Mugabe’s last years in power were a lawless and corrupt absurdity which became impossible to satirise. An example of this is the illegal commuter rank which sprang up along Sam Nujoma Street and the informal enterprises, mostly food vendors and touting, which accompanied it. A small food outlet has grown into a thriving hub serving grilled chicken, chips and sadza dishes mostly to travellers boarding transport to Mazowe and beyond. The food is served from a shabby, cramped unit just off the pavement and, visible through the small serving hatch is a portrait of the president, mounted next to the trading certificates. As a backup, or maybe to convince the sceptics, a second portrait is mounted on the door between the two tiny compartments. Mugabe is gone. Mnangagwa is in. The portrait has a new face, the office a new occupant. 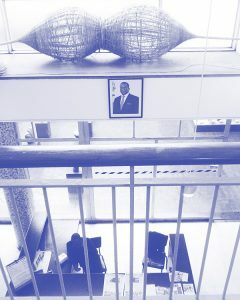 It is re-establishing its position, its gaze, looking down on Zimbabwe, one frame at a time. It has a hold on the nation and, in turn, the nation won’t let go. Perhaps the portrait of the president is just a sheet of paper. Perhaps it doesn’t reflect the power of the incumbent in that office. Instead, it may well reflect us, the people. We look up at it and we see the power we are afraid to assume and the agency we pretend to not have.